This entry was posted in Asian Flavors, Food, Recipes, Salads, Tofu, Vegan or Would-Be-Just-As-Good-Vegan and tagged butternut squash, delicata squash, kale, miso, potatoes, tofu, vegan, vegetarian, winter salad, winter squash on December 4, 2012 by emmycooks. After nearly a year of daily posts, usually dashed off in the moments before midnight, I took a day off yesterday. It was for a good reason, one that many of you will remember or understand: after a few sleepless nights in a row, I fell asleep snuggling my one-year-old at 7 p.m. A rare indulgence. Delicious. 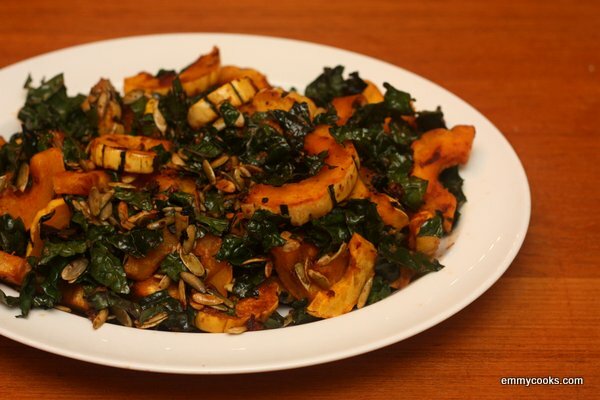 This entry was posted in Asian Flavors, Food, My Favorite Recipes, Recipes, Salads, Vegan or Would-Be-Just-As-Good-Vegan, Vegetables By Themselves and tagged curry paste, delicata squash, kale, miso, winter squash on November 8, 2012 by emmycooks. Have you entered this week’s cookbook giveaway yet? You have until Monday night to enter! This entry was posted in Food, Recipes, Salads, Vegan or Would-Be-Just-As-Good-Vegan and tagged bread, garlic, kale, lemon, mayonnaise on November 2, 2012 by emmycooks. 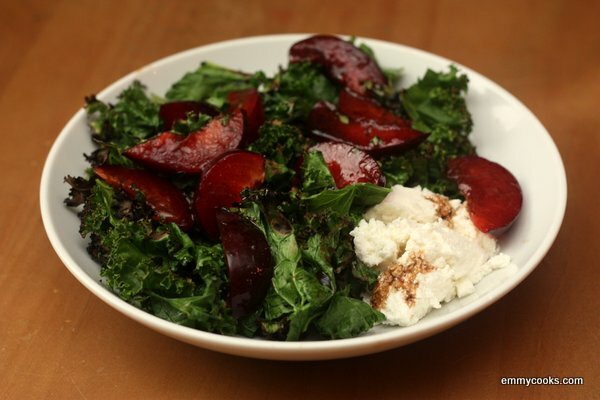 I have been having a bit of a love affair with this salad this summer. We met casually, in a friend’s back yard. I couldn’t stay away from it, and then I couldn’t stop thinking about it. Our friends came to the Dinner in White and I casually mentioned that they might bring this salad, you know, if they wanted. They did. I sat next to it at the table. It’s been on my mind ever since. Today, by some stroke of luck, J was working from home, the baby was napping, and the older girls weren’t home yet. We took full advantage of that rare quiet moment together. 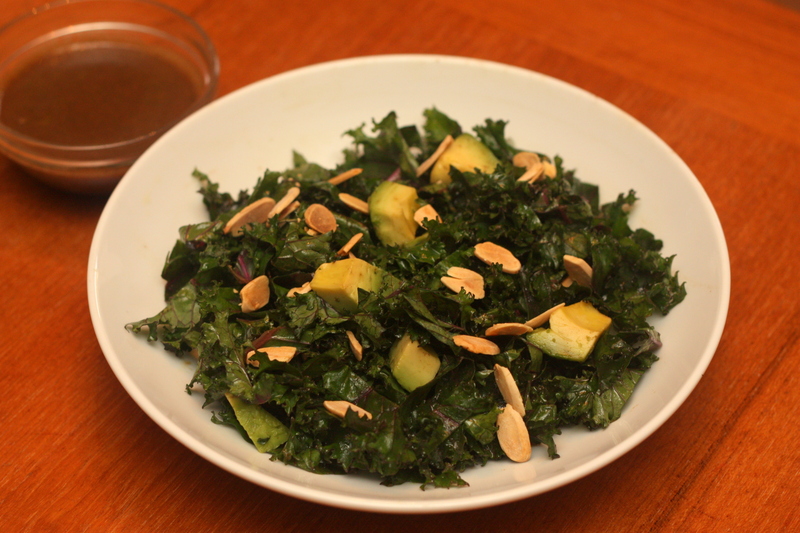 By grilling a bunch of curly kale and having this salad for lunch. This entry was posted in Food, Fruit, Grilling, Recipes, Salads, Vegetables By Themselves and tagged CSA recipes, grilling recipe, kale, plums, salad, summer recipes, vegetarian on September 21, 2012 by emmycooks. When I moved to LA in the late ’90s, I was pretty sure of two things. First, that I was going to love graduate school. And second, that I–born and raised in Northern California–would hate living in LA. But life has that funny way of playing tricks on you sometimes, and of course the opposite was true. About LA: I liked the 72 and sunny, of course, and I liked riding my bike to the beach and the farmers market. I liked breakfasts on Venice Beach and the late-night city scene and did I mention the 72 and sunny? But what I loved most about living in LA was my roommate. Having a good friend means a lot in a new place, and I lucked out when I connected with my roommate through the school’s matching system. She picked me, she later said, because I said I wanted to find an apartment with a balcony so I could have an herb garden. Ours flourished in the three years we lived together, and I was so sad to say goodbye to her when I left my roommate and that apartment to move to Seattle. But life has that funny way of playing tricks on you sometimes, and now she lives in Seattle too. We went shopping for seeds and starts this spring for our respective gardens, and when we had lunch last week she brought me a gorgeous bag of newly-picked kale from her back yard. Old friends, tender new greens, both so nice to have around. This entry was posted in Emmy Cooks Original, Food, Recipes, Salads, Vegan or Would-Be-Just-As-Good-Vegan and tagged black garlic, friendship, gardening, kale, LA, salad, vegan, vegetarian on June 27, 2012 by emmycooks. The core ingredients are, as you may have cleverly deduced, beans (white ones) and greens. The spare supporting cast includes a small onion, garlic, chile flakes, white wine and rosemary. These bit players can be swapped or omitted depending on availability. 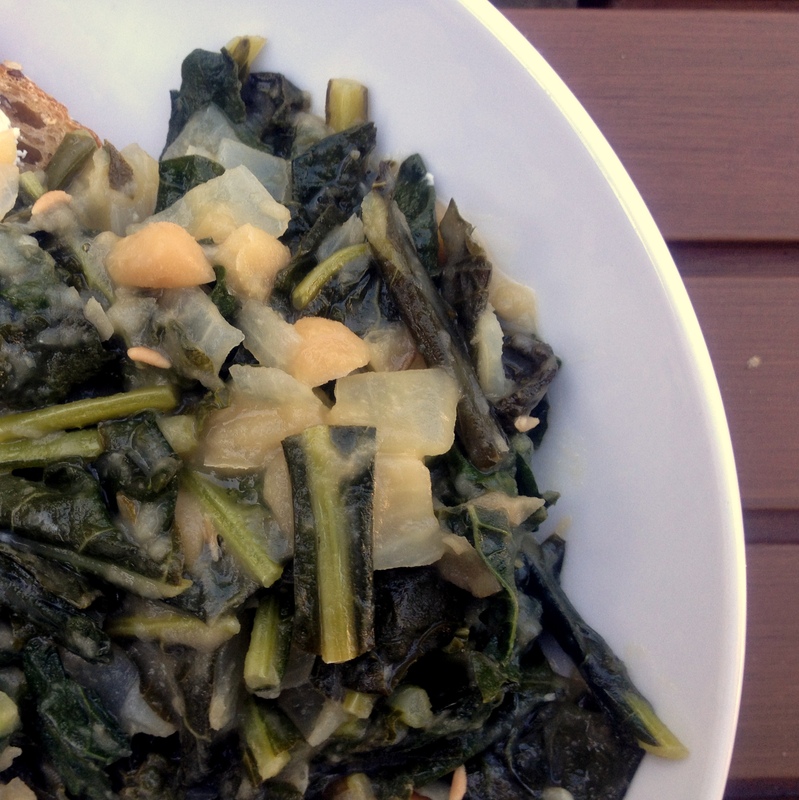 I most recently made this dish with lacinato kale, but any kind of hearty green will work. I have been known to combine kale, chard, beet greens and radish tops when the fridge is full to bursting. This entry was posted in Beans and Other Legumes, Food, My Favorite Recipes, Recipes, Vegan or Would-Be-Just-As-Good-Vegan and tagged beans, chard, dinner, feeding a family, good with goat cheese, greens, kale, protein, vegan, vegetarian on June 12, 2012 by emmycooks. I love green salads. 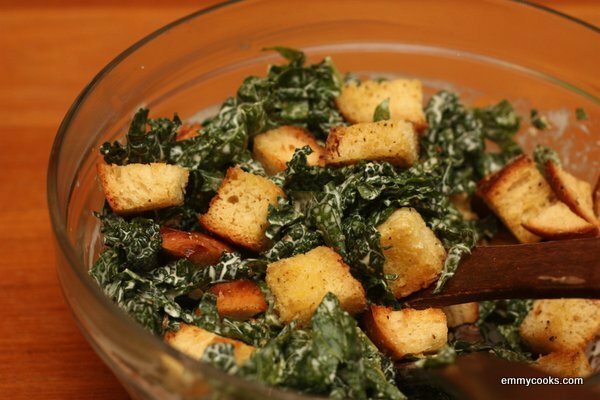 A crisp, lemony romaine salad? Smoked salmon and tomatoes nestled into creamy, dill-dressed greens? An arugula salad with grilled potatoes and blue cheese? Yes, please. You know what I don’t love? 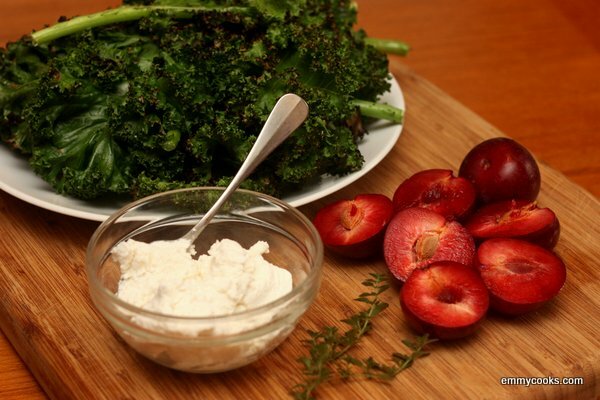 The ubiquitous “garden salad” on restaurant menus. You know the one: wilted (if not decaying) “spring mix,” a few grated carrots, hard cherry tomatoes. That’s it. It’s bound to be a disapointment to anyone who’s ever seen an actual garden. I’m out to redeem the name. This is a gardener’s garden salad. Luckily, you can also put together a reasonable version of it if you have access to a farmer’s market, or if you have a few herbs growing on your windowsill and the good sense to buy a gorgeous, tender head of lettuce. The basic equation is this: some lettuce or baby kale, some soft herbs, some edible flowers, and a light coating of chive vinaigrette. Beyond that, it’s up to you. 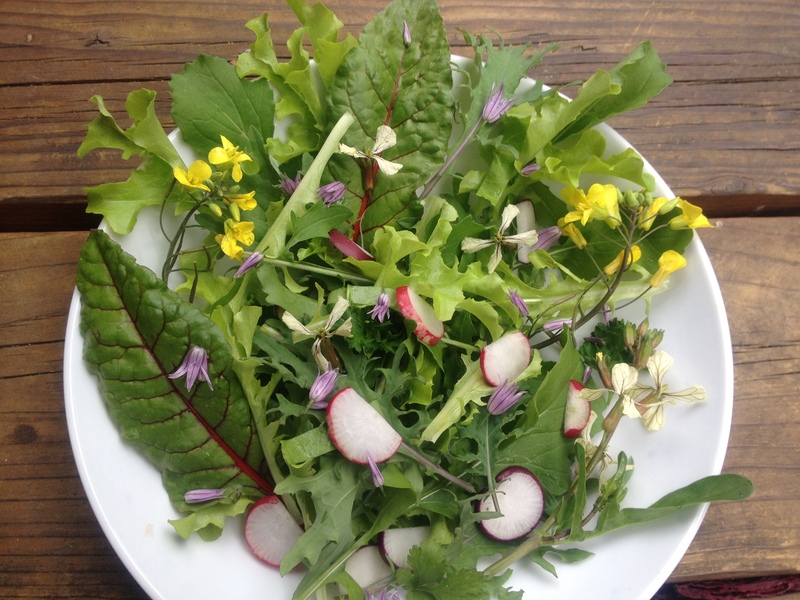 Today, our salad was baby leaves of lettuce, arugula, kale, and ruby chard, a few sorrel leaves cut into ribbons, parsley, cilantro, arugula flowers, kale flowers, chive flowers, and a couple of sliced radishes. Tomorrow, who knows? This entry was posted in Food, Recipes, Salads, Vegan or Would-Be-Just-As-Good-Vegan, Vegetables By Themselves and tagged cooking, DIY, gardening, healthy, homemade, kale, lifestyle, salad, vegan, vegetarian on May 28, 2012 by emmycooks.